How to Create A Powerful Vision to Kick Start The Year! How To Create A Powerful Vision To Kick Start 2017 And Make It Your Best Year Ever! How to Create A Powerful Vision. 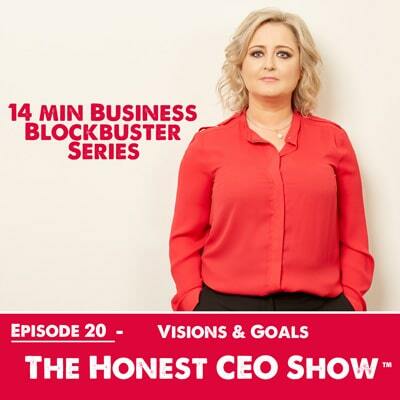 If you feel like you don’t know where to start with goal setting and strategic planning, then this episode is for you. Vision, Strategy & Goal Setting is such an important part of business, particularly as we start the new year in 2017. The first part of goal setting is setting the stage for where you want your business to be in 3 - 5 years time. These are your stretch goals, your stretch goals will influence and assist in defining your intermediate and immediate goals and targets. Your goals for the next 12 month, 6 months and the next quarter. This exercise helps you see the vision you already have within you for your business. What is the biggest vision you have for your business? This vision should scare you. Allow yourself quiet time to ponder and write your answer on a piece of paper. Take a moment to imagine that you're 90 years old and are sitting in your rocking chair, on the veranda overlooking the ocean and you are looking back over your IDEAL life. You are happy and healthy and your business succeeded beyond your wildest dreams. Now answer the questions below. What is it about you and your business that people value? How are you different from the present day? What is the same in your business and what is not? What has your business achieved? What are you proud of? - Get emotional, personal and specific. What are your top 1-3 major accomplishments or “big wins”? Imagine there was a feature article about your success. What did the headlines say? What difference did this make in the world? In the past X years, what is the most significant breakthrough that launched the organization into a whole new level of wild success? How? What happened? Who helped make it happen? What was different? What difference has your business made in people's lives? In the local community? In the world? Whose lives is your work touching? Who are you serving? How exactly are they engaging with you? Why are they choosing to engage with your messages, services or products? What’s in it for them? How has your business added meaning to your life and given you a sense of fulfillment? Partners: Are there new partners that contributed to your success as an organization? As an individual? What are the best parts of your business? What shows you that your business has been a success? What else…What else do you notice that’s different, or the same, in this successful, deeply satisfying future? What kind of abundance is the organization enjoying? What does that look like, specifically? This could also be a team exercise. Team Visioning generates a common goal, hope, and encouragement; offers a possibility for impact; gives people a sense of direction; gives a group something to move toward; and generates creative thinking and passion. This time though ask the team to Imagine 5 years from now. It’s 2021 and we’ve been named the most inspiring company in the world: What three things did we do to get this recognition? What new products, services, or technology did we introduce to get here? What areas of the business have grown to reach these goals? What do you think is our biggest opportunity in the next 1/5/10 years? What skill set do we need on our team? Who is working in the organization – what do they look like, demographically? What is the collective culture like? What practices or group norms do you notice? What else do you notice that’s different, or the same, in this successful, future? Now use post-it notes to brain dump the patterns and arrive at a few core themes that resonated for the whole group. When I’ve conducted this with my teams previously they always left feeling energized, inspired, and aligned around a whole new level of collective work. The next step is to document that goals, and start to start to plan “how” you are going to achieve them, and a time line and accountability for implementation. Without action, the above is useless. Now, over to you our listeners, once you’ve done the visioning exercise, tell us what came out of it.